Wednesday marks only 21 days left until Christmas! 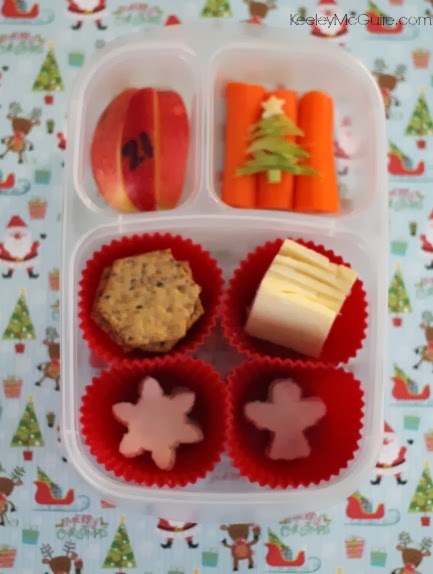 I love celebrating the month of December with our Advent Lunches... but at the same time, it's crazy to see the days tick by so quickly! Ahh! I'm also traveling for work this week - I'm actually writing this post while waiting at the airport for my flight this evening. Traveling means lots of lunch planning and packing ahead for my Little Miss while I'm away. 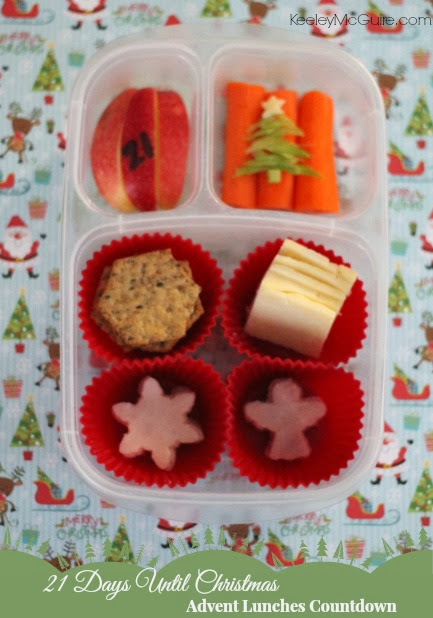 Little Miss has Crunchmaster Gluten Free & Vegan crackers, cheese squares, turkey snowflake cutouts, and angel ham cutouts. Also packed are apple slices (where I noted our countdown number 21 with food safe marker), carrot sticks, and a Christmas tree made from broccoli stem shavings.